The report that everybody's talking about this morning is Oxfam's opus on global inequality, which leads with an eye-popping statistic: The richest 85 people in the world own more wealth than the bottom half of the entire global population. Yes, that equation works out to: 85 > 3,000,000,000. Before we dig into the document, a programming note about wealth inequality. Wealth isn't income. Salary is income. But investments—stocks, houses, or equity in a business—build wealth. Wealth comes from the money you don't immediately spend. Since poor people spend more of their income immediately, and rich people save/invest more of their income immediately, it's predictable that wealth inequality be much worse than income inequality. That said, the document is full of figures that will make your head explode if you are about income inequality. Here are five. 1) Seven in ten people live in countries where inequality has increased, and the United States is leading the wave. This graph from the report looks at national income (not wealth) accumulation to the top one percent, but it makes a clear point that inequality is rising everywhere, but nowhere more than the U.S.
2) The richest 1 percent saw its share of income rise in 24 out of 26 countries for which Oxfam collected data between 1980 and 2012. Again, the story here is the U.S. leading a global trend. 3) Related to the graph above: In the US, the wealthiest one percent "captured 95 percent of post-financial crisis growth since 2009," Oxfam reports. The bottom 90 percent actually lost wealth. 4) Every high-income G20 country is experiencing rising inequality except for South Korea. Meanwhile, numerous Latin American countries, including Brazil, Mexico, and Argentina, are seeing inequality levels decline thanks to a combination of income graph and high taxation and public spending. 5) The wealth of the one percent richest people in the world amounts to $110 trillion—15x more than the wealth held by the bottom 70 percent. So, global wealth inequality is real. But so is global poverty reduction. 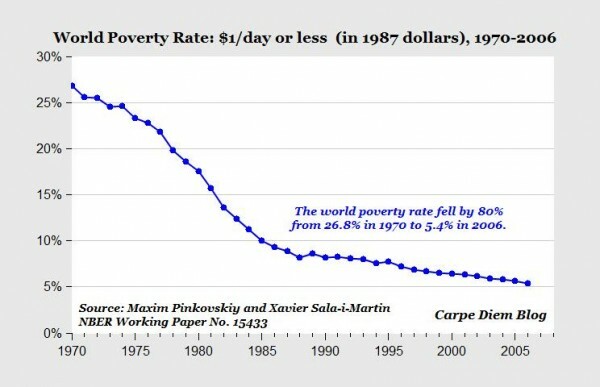 Since 1970, the world poverty rate has declined by 80 percent. I like the note both for what it says and what it doesn't say. The Gates' reject the idea that poor states are doomed to permanent poverty and they defend the record of foreign aid. But they also don't pretend that wealth redistributed from the West, alone, will end the cycle of poverty in parts of sub-Saharan Africa and Asia. It's not enough for poor countries to accept excess tax revenue from their "most productive neighbors." They'll have to "learn" from them, too.